Clinical studies to date reported high survival rates with fixed dental prosthesis (FDPs) made of yttria partially stabilized zirconia (Y-TZP). Yet, the veneering ceramic layer that is responsible for the final optical outcome and anatomy of the FDP, with lower mechanical properties than Y-TZP, continues to exhibit high chipping rate. This clinically undesirable situation, which is in fact the failure of the system, may interfere with appearance and function and be costly in cases of early failures. Since understanding the factors related to veneer ceramic chipping may diminish such clinical failures, this review presents information on the mechanical and microstructural characteristics of veneering ceramics, challenges posed onto this material in the oral environment, mechanisms of generation of thermal residual stress profiles during cooling in bilayered FDPs, and process-related issues to circumvent chipping. 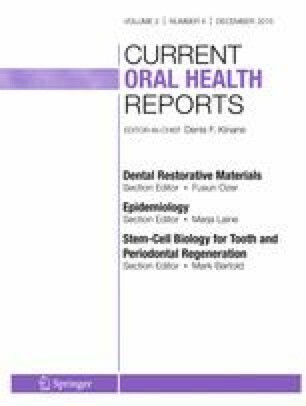 This article is part of the Topical Collection on Dental Restorative Materials. Yttria-stabilized tetragonal zirconia polycristal (Y-TZP) has become the most relevant ceramic material used for the production of fixed dental prosthesis (FDP), replacing metal alloys to a great extent over the past decade . The successful outcome of Y-TZP FDPs has been associated with the intrinsic material toughening mechanism that occurs through phase transformation from tetragonal to monoclinic crystalline form. This transformation phenomenon results in the creation of compressive stresses around microstructural defects that occur primarily during milling or any kind of processing flaws that are subjected to tensile stresses. Since Y-TZP is able to react to the unfavorable tensile stresses generated during functional loading by changing phases, this ceramic has been regarded as a “smart material” [2, 3]. Failure reports on hip prostheses made of Y-TZP in the field of orthopedics in the early 2000s, attributed to low temperature degradation, did not prevent dental researchers and clinicians to begin exploring the use of this material for the construction of FDPs [4, 5]. With the advances in clinical and laboratory research, the dental community became more confident that the problem of low temperature degradation that caused the failures of hip prostheses would not result in a higher rate of clinical failure in FDPs made of Y-TZP as the framework material. It is likely that the environmental conditions, to which a hip prosthesis is submitted, are drastically different from those found in the oral cavity. Moreover, until very recently, only very small portions of the Y-TZP framework were directly exposed to the oral fluids as it was almost entirely covered by a veneering ceramic. Thus, the risk of low temperature degradation would be very low with dental reconstructions. Clinical studies have shown that after 3 to 5 years of follow-up period, although the Y-TZP framework remained intact, veneering ceramic layer showed incidence of chipping at varying degrees [6, 7, 8]. According to a recent review [9•], in a total of 31 clinical studies evaluating veneered Y-TZP crowns, 15 of them reported chipping of the veneering ceramic with a rate of more than 10 % between 2 and 8 years. On the other hand, lately, the clinical performance of veneered Y-TZP FPDs was reported to be comparable to that observed for metal-ceramic FDPs [10, 11]. The improved clinical performance of such FDPs over the years has been associated with the slow cooling protocol employed for the FDP after sintering of the veneering ceramic. However, currently, the literature lacks more consistent clinical data to confirm the long-term reliability of such prostheses. One systematic review categorized the types of veneering ceramic chipping on Y-TZP frameworks [12•], so that chipping grade 1 was considered for very small fractures that do not need to be repaired but could be simply polished and chipping grade 2 was considered for moderate fractures that usually requires direct repair in the oral cavity using photo-activated resin composites. On the other hand, relatively large fractures in volume that require removal and remake of the entire FPD were classified as chipping grade 3. Fortunately, most clinical studies reported frequent chipping grades 1 and 2 and seldom grade 3, providing that the power of such studies is relatively low and that the lack of multiple observers in these trials poses a high risk of bias. Nonetheless, the chipping problem of the veneering ceramic is still considered a very inconvenient complication in the dental practice that necessitates attention of researchers and clinicians to solve the problem. Material scientists in dental and other engineering arenas spent efforts to better understand the problem and propose solutions that could result in increased clinical lifetime for these restorations. In fact, the chipping issue is affected by a number of different factors ranging from mechanical properties of the bilayered structures, thermal behavior, design of the Y-TZP framework, and interactions between the veneer and framework interface [13•, 14–18]. One of the main factors responsible for chipping is the low mechanical property of veneering ceramics compared to other ceramics used for frameworks. The fracture toughness of veneering ceramic is about 1 MPa/m1/2, while the fracture toughness of Y-TZP can be as high as 10 MPa/m1/2 due to the phase transformation toughening mechanism [13•]. The low fracture toughness of veneering ceramics on the other hand is related to their microstructure that is composed of essentially a relatively weak glassy matrix and small amounts of leucite crystals, ranging from 5 to 30 %, depending on the commercial brand and the application type . The glass composition of the ceramic matrix is highly susceptible to subcritical crack growth (SCG) [15, 16], which occurs as a consequence of corrosive action of water in combination with tensile stresses concentrated around the crack tip [17, 18]. In the oral cavity, the veneering ceramic surface is constantly exposed to saliva and subjected to tensile stresses generated by mastication forces. The combination of these two factors eventually leads to slow growth of defects that will ultimately decrease the lifetime of the material. SCG occurs when a small defect initially propagates up to a critical size and later grows in an unstable manner, causing the undesirable chipping of the veneering ceramic layer. An important factor that should be taken into account regarding SCG is the inherent microstructural defects that are generated during processing of the prosthetic reconstruction [19•]. When the porcelain slurry is applied with a brush over the framework and subsequently sintered, the resulting veneering layer usually displays high porosity. These pores inherent to the overall processing technique have been identified as the fracture origin in veneered Y-TZP crowns that fractured in clinical studies . A frequent fracture origin is attributed to wear facets formed as a consequence of function or tooth grinding that takes place usually after 2 years . Based on such clinical fractography findings, it is evident that the veneering ceramic is very susceptible to the accumulation of microscopic surface contact damages caused by the antagonist dentition [21•]. Another fact that influences the incidence of veneering chipping is the thermal stress generated during cooling of the restoration in the sintering furnace [22, 23]. In this case, the last sintering cycle is critical as it determines the final stress profile within the veneering layer. Thermal residual stresses in all-ceramic reconstructions are highly dependent on two factors namely the differences in the coefficient of thermal expansion (CTE) between the veneering ceramic and Y-TZP, and the temperature gradient created along the veneering layer during cooling [22, 23]. The first factor is related to evidences indicating that during cooling of the FDP, the differences in the CTE between the veneering ceramic and Y-TZP framework yield different rates of contraction. Consequently, tensile or compressive residual stresses are generated and distributed heterogeneously along the two ceramic layers. The second factor, temperature gradient, on the other hand, is related to the fact that both veneering ceramic and Y-TZP exhibit very low thermal diffusion. The difference between the temperature of the veneering ceramic surface and the framework may exceed 200 °C in specimens with 0.7 mm in thickness . Thus, both materials need time for the surface temperature to match that of their inner portions. Such temperature gradient also results in the generation of residual stresses along the reconstruction during the cooling procedure [25•]. When these residual stresses are of the tensile type, they will increase the risk of fracture for the veneering layer. Since they are already located within the reconstruction prior to the cementation procedure, even lower stress levels during chewing function are sufficient to reach the critical level that will ultimately lead to unstable crack propagation and chipping of the veneering layer. The proposed solution in order to reduce the formation of such tensile residual stresses during the fabrication of the Y-TZP FDPs was to employ sintering cycles with slower cooling rates than those used for metal-ceramic FDPs. Although this cooling protocol has been shown to be effective in several in vitro studies [25•, 26•] in terms of reducing the residual stress level, there is still no clinical evidence that it significantly reduces the chipping rate of veneering ceramics in Y-TZP FDPs. Some other studies indicated the importance of the design of the Y-TZP framework and postulated this to modulate the risk of veneering chipping [27, 28, 29]. Especially in posterior implant-borne FDPs, constructed from Y-TZP abutments covered with veneering ceramic, it is very common that large volumes of ceramic need to be applied to reproduce the appropriate anatomy of a molar tooth. In such cases, the interproximal region is usually reconstructed with a large amount of ceramic without having the underlying support of the Y-TZP framework. This type of unsupported design has been regarded as the cause of some of the chipping events reported in proximal areas. Hence, individualized design of the framework according to each clinical has been proposed in an attempt to give good support to the veneering ceramic layer [27, 28, 29]. Microstructural and compositional changes at the veneering ceramic/Y-TZP interface may also have consequences on the initiation of residual stresses and, thereby, delamination and chipping of the veneering ceramic . In one study, the veneering ceramic sintered on a Y-TZP framework was removed by acid etching, and the resulting framework surface showed grains of tetragonal zirconia that had transformed into monoclinic grains due the direct contact with the water coming from the ceramic slurry in association with high sintering temperatures . More recently, Mainjot et al. [31•] performed a three-dimensional characterization of the veneer/Y-TZP interface using a focused ion beam microscope and demonstrated a significant change of the crystal grains from tetragonal to monoclinic phase along with relatively large microcracks in the Y-TZP surface that was in contact with the ceramic slurry. However, the origin and nature of these structural changes are not well established yet, and the authors hypothesized that there might be an interdiffusion process occurring between the veneering ceramic and Y-TZP at the interface. In addition to the aforementioned solutions, some more innovative options based on modifications of the processing protocols have been proposed to minimize the chipping risk. One well-established process in dentistry is the injection or press-on technique that was introduced in the early 1990s and is characterized by hot-pressing the veneering material on the framework . In this technique, typically, an external force at high temperatures is applied, resulting in a veneering layer with lower porosity and better mechanical properties as opposed to the layering technique through conventional stratification . The injection processing technique takes place in a special furnace containing a piston that presses ceramic pellets on the Y-TZP framework that was previously milled and sintered. However, there is scarce information available on the success rate of these solutions neither in vivo nor in vitro. In one study , the load-bearing capacity of Y-TZP crowns veneered with either layering or injection method was measured, the latter showing numerically higher fracture loads yet statistically not significant. Regarding the type of failure, the injection method showed chipping only at the veneering layer, whereas all other systems showed predominantly fractures of both the framework and the veneering layer. In addition to new processing methods, recently, another system (Vita Rapid Layer system, Vita, Bad Säckingen, Germany) was introduced, in which a Y-TZP framework and the feldspathic veneering ceramic are milled out of two ceramic blocks developed for CAD/CAM technologies. These two components are then bonded using cement. Since in this system the sintering step is performed only for the Y-TZP framework and not for the veneering, possible formation of residual stresses is eluded. One alternative technique involves bonding of two previously milled structures, the so-called CAD-on system (Ivoclar Vivadent, Schaan, Lichtenschein). This method is based on milling the Y-TZP framework and the lithium disilicate glass-ceramic as veneering ceramic and bonding these two constituents with glass-ceramic instead of cement. Only one single sintering cycle is then used to bond of the components and also to finish the crystallization of the lithium disilicate layer which is a glass-ceramic veneering material with superior mechanical properties compared to feldspathic porcelains. A previous study evaluated the fracture resistance of molar crowns constructed using CAD-on technique in which lithium disilicate glass-ceramic veneer layer was either cemented or bonded with a fusion glass layer on the Y-TZP framework [34•]. The results were more favorable with the use of fusion glass layer yet not statistically significant. Furthermore, the fractographic analysis revealed cohesive and adhesive fracture patterns that resulted in chipping of the veneering layer regardless of the processing method. Determining the chipping resistance of the veneering ceramic layer on Y-TZP framework is not an easy task. In that regard, Quinn reviewed the chipping performance of different dental materials such ceramics and resin composites, with a focus on resistance to edge chipping [35••]. The results clearly showed the influence of geometry of the indenters. Various groups of materials were tested in previous works of the same author, such as feldspathic porcelains, glass-ceramics, alumina pollycristal, Y-TZP, resin composites, and even polymethyl methacrylate (PMMA)-based denture materials. The specimens evaluated in this review had different sizes and shapes, ranging from fragment bars with a cross section of 3 to 4 mm, to larger blocks with length ranging from 10 to 20 mm and 5 to 6 mm thick. The specimens constructed for such tests needed to have well-defined edges. Interestingly, this review highlighted the fact that Y-TZP was the material being most resistant to chipping followed by PMMA-based denture material and in descending order alumina, resin composites, glass-ceramics, dental porcelains, and hybrid ceramic-resin materials. Chipping type of failure of veneering ceramic on Y-TZP FDPs continues to be a clinical problem degrading the longevity of such reconstructions in prosthetic dentistry. While the reasons for failure range from inherent material properties to processing techniques or from geometry of the framework to temperature-dependent residual stresses, there are still few testing methods to predict possible occurrence of chipping failures. Unfortunately, due to low power, bias, or poor design of current clinical trials, the main reason for chipping for the individual case cannot be singled out in clinical trials. Thus, clinicians indicating Y-TZP FDPs for any reason may consider possible predisposing factors highlighted in this review to elude chipping phenomenon.